Taylor LaFleur really likes dirt. And he loves to cook. So it was a natural and intriguing combination for him last week to roast a dozen kohlrabi for three hours in an earthen crust of soil, egg white, salt and water. When the fist-size vegetables were tender, LaFleur broke the crust, peeled off the dirt and served them with a chicken-stock glaze sprinkled with flowers, herbs and wild greens, and topped with crispy beets. With the exception of the salt in the doughlike mud that encased the kohlrabi, the ingredients LaFleur used — including the soil — came from Echo Farm in Whallonsburg, N.Y. The creation was one of several dishes he and his farming/cooking partner, Dillon Klepetar, served at a community dinner in Keene, N.Y. The two men run a business, Farmstead Catering, in which they produce food on their farm and prepare and serve it for special occasions — most commonly weddings. "We really like the farm, and it makes a difference to us that the food comes from here and tastes like here," LaFleur said. "We're serving food in a way that most people aren't used to eating." The weddings comprise Echo Farm's CSA, or community-supported agriculture, program. In this model, members purchase a share of the farm yield up-front. In return, each receives a portion of the harvest, typically once a week. Variation exists within the model, including specialty CSAs, such as meat or flowers only; those that include value-added products such as pickles, pesto or yogurt; and year-round CSAs. At Echo Farm, members are couples engaged to be married who book the banquet — from seed to service — about a year in advance of their wedding. The 165-acre diversified farm, which uses organic practices, grows produce and flowers, and raises meat and poultry for the wedding meal. The catering branch of the business prepares the meal from ingredients almost exclusively produced at the farm. Prices range from $75 to $120 a plate, depending on the menu. "For us, we're not really farm-to-table," said Klepetar, 31, a 2008 graduate of Saint Michael's College and native of Gansevoort, N.Y. "There's no 'to.' This is single-origin, whole-farm food. We'll tell you when an ingredient doesn't come from the farm. That's the exception, not the rule." The small list of exceptions includes items such as lemon, salt and olive oil — though the caterers use primarily sunflower oil produced at a nearby farm. 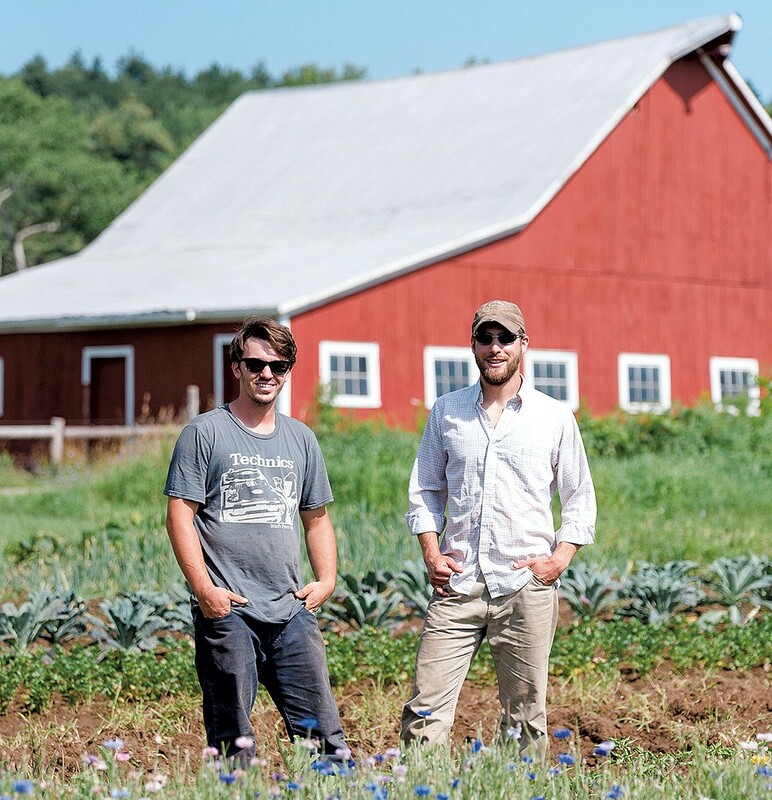 Farmstead Catering, conceived and founded by Klepetar three and a half years ago, represents a niche CSA model — possibly a unique one — according to the Northeast Organic Farming Association. Erin Buckwalter, NOFA's market development director, said the style and variety of CSAs are increasing, yet she is unaware of any in the Northeast set up like Farmstead Catering & Echo Farm. The CSA produces six to eight weddings a year. This year, additional bookings such as a farm dinner, a birthday party and other special occasions raised the number of events to about a dozen. But Farmstead's primary focus is the wedding business. "We're growing ingredients for a plate of food that we know about a year in advance," Klepetar told Seven Days during a recent visit. "We're timing every crop and every generation of animal so that it's fresh and at peak flavor for the wedding. When we're out here doing chores, we've got that plate and that wedding couple in mind." He was talking as he carried a bucket of milk from his Jersey cow through a wooded lane to five pigs at their hillside pasture. Two of the sows will be breeders so that Klepetar can continue to raise Gloucestershire Old Spots, a breed he favors for its foraging (and thus flavor) attributes. The other three pigs will become part of the meal at future weddings — one this fall, another next spring. "These pigs are owned by the wedding clients," Klepetar explained. "This is a bacon-wrapped roasted pepper next spring." Taylor LaFleur preparing a meal in Keene, N.Y. In a perennial garden, Klepetar and LaFleur grow asparagus, chives, lemon balm, sorrel, rhubarb and berries — ingredients for spring salads, dressings and aioli. Eggplants are grown for eggplant Parmesan. Salad greens are planted 32 days before a wedding and harvested the morning of the vows. Ducks are raised for duck confit. Cherry tomatoes from the greenhouse were picked last week to make Sun Gold tomato sorbet, which LaFleur served between courses at the dinner in Keene. "This process starts out as the dirtiest, ugliest thing," Klepetar said. "Weeding, planting, covered in mud and mulch. It gradually gets more and more beautiful as things grow. And then there's the plate, with its wildflower garnishes that are edible." "From a food standpoint, Dillon absolutely over-delivered in terms of what we had envisioned," Smith said. "Everybody that we talked to was blown away and thought the food was amazing. I did, too." The Smiths also appreciated their visit to Echo Farm before the wedding, where they tasted some of Klepetar's food — planning their menu accordingly — and saw how the animals are raised. "We both felt like we wanted to know a little bit more about the food we were serving," Smith said. "We wanted the meal to be special, and we were looking for something more environmentally conscious." Klepetar came to farming after his graduate coursework at American University in Washington, D.C., from which he holds a PhD in political science. His dissertation, which he completed while farming, studies the impact of losing Congressional candidates on the political agenda. Klepetar said he applied the guiding words of his physician-father's profession — "first, do no harm" — in choosing to work as a farmer and cook. After farming on rented land for a year, Klepetar purchased Echo Farm in 2015. He also moved the cooking aspect of his business from the kitchen at the local grange hall to the one at Hub on the Hill, a shared commercial kitchen available for rent in Essex, N.Y.
"I felt like farm-to-table could be closer to the farm," Klepetar said. "I ate out enough, and I saw that the farm-to-table thing had a little bit of greenwashing. You might have a salad from the farm, but most things were off the back of a Sysco truck." LaFleur, 28, from Cape Cod, is a 2011 graduate of the University of Vermont, where he majored in agriculture and horticulture. He talked his way into a cooking job in New Zealand on a summer trip after his freshman year and worked for a time in the kitchen at the Farmhouse Tap & Grill in Burlington. 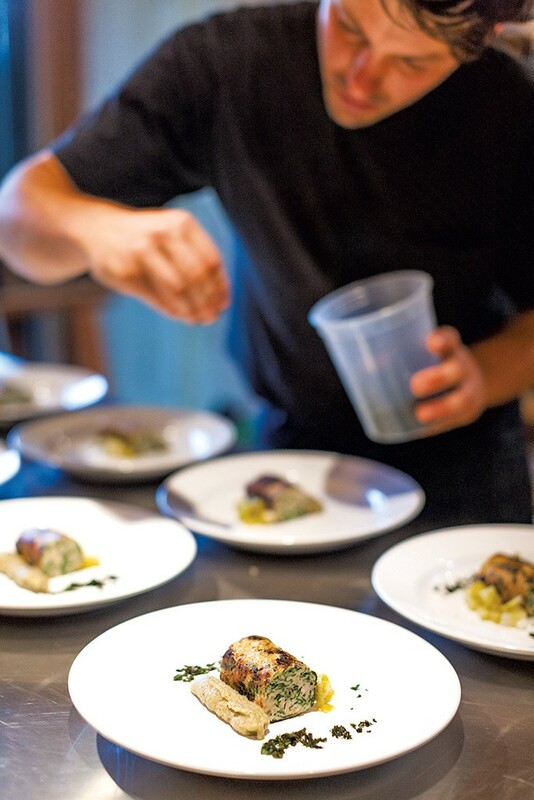 He was working at Essex Farm, a diversified CSA, when he met Klepetar; he joined Farmstead Catering six months ago. LaFleur's interest these days is working with ingredients that can be grown in the Champlain Valley, letting their flavor, texture and harvest schedule guide him in the kitchen. This approach — applying thought and creativity but few additional ingredients — develops a kind of regional palette that showcases the crop, like the kohlrabi baked in Echo Farm soil. "We can't tell our farmer that we're looking for better stuff, because we are our farmer," LaFleur said. "And we are looking for better stuff." Echo Farm hosts its first on-farm dinner on Saturday, August 12, on Walker Road in Whallonsburg, N.Y. Learn more at farmcateringny.com. The original print version of this article was headlined "Conscious Catering"